Today’s topic is going to be about wheels and tracks as they pertain to FIRST ROBOTICS. We have received a lot of interest in our pneumatic wheels and our tracks due to the obstacles for this course. For a complete list of all of our wheels, click here. For a complete list of our tracks, click here. We offer flat tread material for sale by the foot, complete systems designed for our tactical robots and molded, continuous loop treads for making your own cleats. The best-selling wheels we have are the 10-inch pneumatic wheels. . They will give you great ground clearance and a lot of traction. They have a 4-bolt pattern that bolts to our shafts. We have shafts by themselves and bearings that go with them as well. 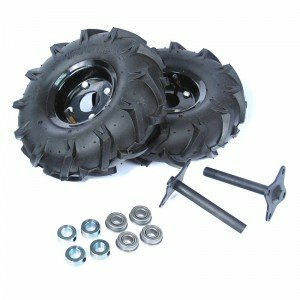 Our 6-inch pneumatic tires, and maybe a suspension, would work great with obstacles of similar height. 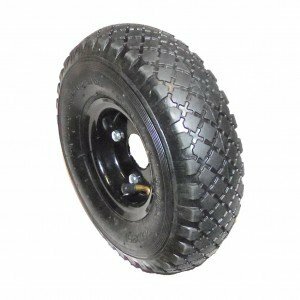 If you need traction, we have our Traction Lug 10 x 3.50-4 Tiller Tires. The lugs on the tires give great traction, but require a lot of power to turn (especially on carpet). 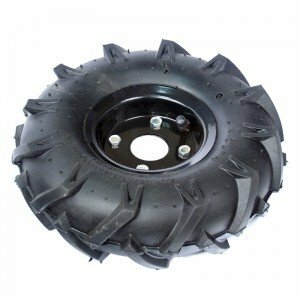 For even larger wheels, we have 13-inch traction lug tires. . We make shafts that go with these wheels that are ¾-inches in diameter with a ¼-inch keyway. We sell the bearings, and we sell all of the parts in pairs. As a side note, we like to mention that all of the pneumatic wheels need to be inflated to keep the tire from spinning on the inside of the rim. When this happens, the valve stem will tear off, deflating the tube. If there is one thing we have learned, it’s that track design is not trivial. We have been building treaded robots for over 10 years, and, at generation 4, they’ve been through many stages of evolution. It takes a lot of research and development in order to produce treads that stay on under tough circumstances. We’ve done it, performing NIST qualification tests using our LT2 robot and generation 3 and 4 tracks. No kicking off or jamming. FIRST robotics participants, in particular, should know that courses are designed specifically to challenge tracks, and to really test whether the robot’s tracks can stay put. 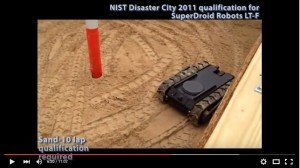 See our tracks in action as the LT2 F qualifies at NIST Disaster City. If you are on a budget and up for the challenge, you can build your own tracks inexpensively. We have bare-bones rubber tread, by the foot, in two, four and 6-inch widths. You will have to make your own holes or add timing cleats to the robot tread. We typically use UHMW, screwing them into the tread. For positive timing, you can also use a hole punch for rubber to punch holes in the track. We do not have any wheels for the cut-to-length tread material. These are DIY tracks so you need your own wheel design. If you have never built tracks before, we recommend our track and wheel sets that we’ve designed and tested. You’ll save a lot by doing it yourself, but there is a reason for the price. Our tracks and wheels, custom molds, custom CNC jigs (for attaching the cleats) and custom machined wheels are all designed specifically to work together to provide great traction and grip without derailing. We also have complete track systems that include wheels, axles and sprockets. We have alligator lacing for splicing the tread together. We have molded treads designed for our tactical robots. We can get custom lengths of all of these. Custom orders are sent out for molding, which adds to manufacturing time. Our LT2 Molded Spliceless Tracks would probably be the best size for First Robotics challenge. They have a circumference of about 60 inches, and are 2.75 inches wide. You can order the track and wheel set (above), or just the treads. For more options on the LT2-size treads, you can order just the molded track without any cleats. If you have a design in mind, you can use these to start the process and later screw on any timing cleats you need. If you want a larger set of tracks, we have our HD2 tracks and wheels. 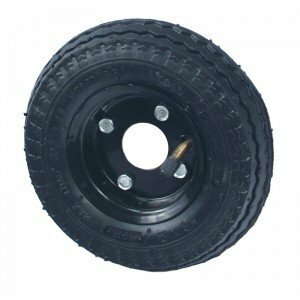 These wheels have a circumference of about 85 inches, and are four inches wide. 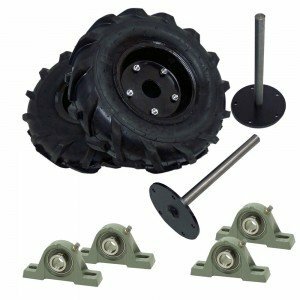 We sell the entire kit, wheels and treads or the treads themselves, just as we do the LT 2. 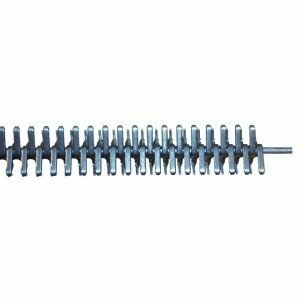 We also sell just the molded tread material without any cleats.